A paper published today in Quaternary Science Reviews finds the tectonic uplift rates of the Channel Islands in California are "are much lower than reported earlier" and "are similar to most other parts of coastal California." The authors also find uplift rates are similar between the Channel Islands, Barbados, and the Florida Keys, and were only ~0.1-0.2 mm/year over the past ~15,000 years, but began to level off to rates of less than half that around 10,000 years ago to the present sea levels. The University of Colorado, however, adds a highly controversial glacial isostatic adjustment adjustment of 0.3mm/yr to global sea level rise, which may be exaggerated and artificially increasing estimates of sea level rise due to thermal expansion or ice melt. 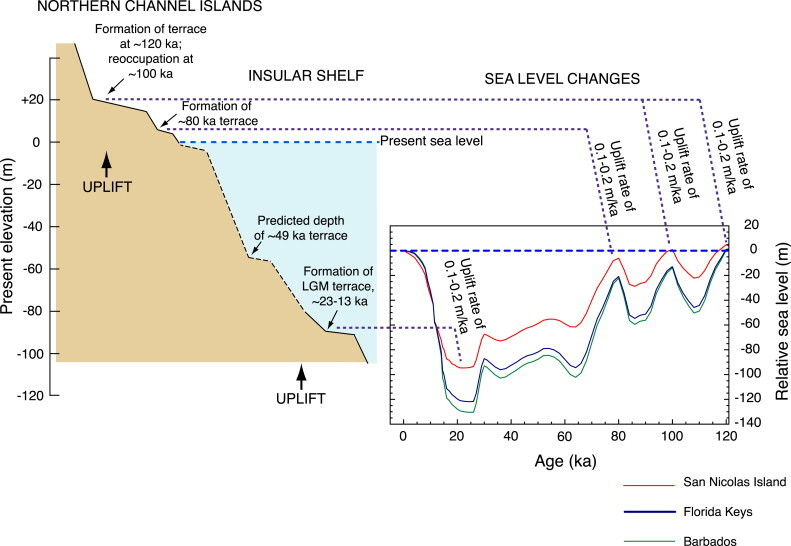 The paper also shows that sea levels of the Channel Islands were naturally 20 meters [66 feet] higher during the last interglacial ~120,000 years ago. The paper joins many others demonstrating sea levels during at least 4 prior interglacials over the past 500,000 years were higher than during the present interglacial period [up to 31 feet higher during the last interglacial alone]. Thus, there is no evidence that the [decelerating] sea level rise over the past ~20,000 years is unusual, unprecedented, or unnatural. Figure from the paper showing uplift of Channel Islands, Florida Keys, and Barbados was ~0.1-0.2mm/yr from ~15,000-10,000 years ago and decelerated to less than half that rate over the past 10,000 years. The figure also shows that sea levels of the Channel Islands were naturally 20 meters [66 feet] higher during the last interglacial ~120,000 years ago. The positive global sea level rise trend from satellite altimetry is almost entirely due to an apparent huge wind-driven "bulge" located in the Western equatorial Pacific region. 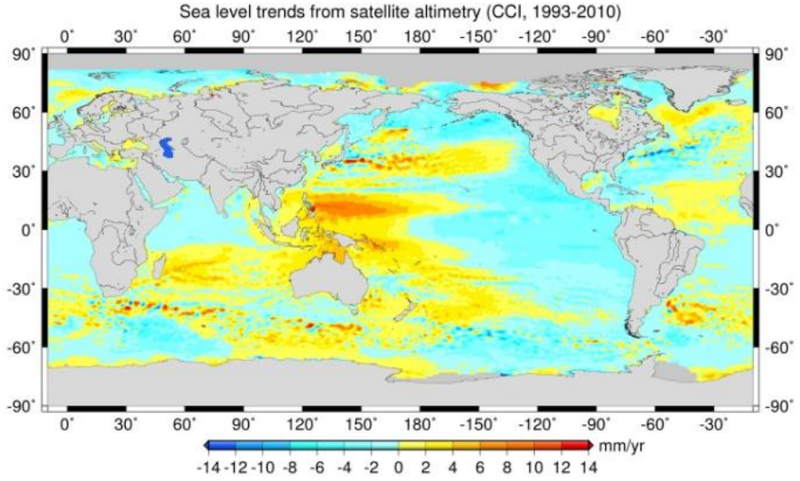 Conversely, all areas shown in blue have experienced a drop in altimetric sea levels [different from relative sea levels which are more dependent upon land height changes] from 1993-2010, including most of the East and West coasts of North and South America. This data is after addition of the likely exaggerated GIA of 0.3mm/yr. 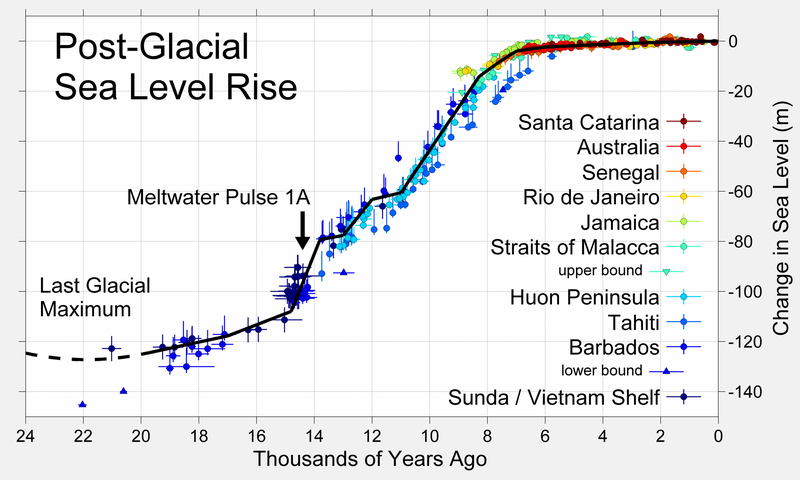 Global sea levels have been naturally rising for ~20,000 years and have decelerated over the past 8,000 years, decelerated over the 20th century, decelerated 31% since 2002 and decelerated 44% since 2004 to less than 7 inches per century. There is no evidence of an acceleration of sea level rise, and therefore no evidence of any effect of mankind on sea levels. Sea level rise is primarily a local phenomenon related to land subsidence, not CO2 levels. Therefore, areas like Miami, Florida and the Florida Keys which are built on soft limestone have higher rates of relative sea level rise, but this has absolutely nothing to do with man-made CO2. The 2nd marine terrace on the northern Channel Islands is ∼120 ka (U-series, coral). Tectonic uplift rates on these islands are 0.12–0.20 m/ka [meters/1000 years] in the late Quaternary. Uplift rates for the northern Channel Islands are much lower than reported earlier. Differences in uplift rate estimates are due to considerations of GIA effects. Channel Islands uplift rates are similar to most other parts of coastal California. The Pacific Rim is a region where tectonic processes play a significant role in coastal landscape evolution. Coastal California, on the eastern margin of the Pacific Rim, is very active tectonically and geomorphic expressions of this include uplifted marine terraces. There have been, however, conflicting estimates of the rate of late Quaternary uplift of marine terraces in coastal California, particularly for the northern Channel Islands. In the present study, the terraces on San Miguel Island and Santa Rosa Island were mapped and new age estimates were generated using uranium-series dating of fossil corals and amino acid geochronology of fossil mollusks. Results indicate that the 2nd terrace on both islands is ∼120 ka and the 1st terrace on Santa Rosa Island is ∼80 ka. These ages correspond to two global high-sea stands of the Last Interglacial complex, marine isotope stages (MIS) 5.5 and 5.1, respectively. The age estimates indicate that San Miguel Island and Santa Rosa Island have been tectonically uplifted at rates of 0.12–0.20 m/ka [meters/1000 years] in the late Quaternary, similar to uplift rates inferred from previous studies on neighboring Santa Cruz Island. The newly estimated uplift rates for the northern Channel Islands are, however, an order of magnitude lower than a recent study that generated uplift rates from an offshore terrace dating to the Last Glacial period. The differences between the estimated uplift rates in the present study and the offshore study are explained by the magnitude of glacial isostatic adjustment (GIA) effects that were not known at the time of the earlier study. Set in the larger context of northeastern Pacific Rim tectonics, Channel Islands uplift rates are higher than those coastal localities on the margin of the East Pacific Rise spreading center, but slightly lower than those of most localities adjacent to the Cascadia subduction zone. The uplift rates reported here for the northern Channel Islands are similar to those reported for most other localities where strike-slip tectonics are dominant, but lower than localities where restraining bends (such as the Big Bend of the San Andreas Fault) result in crustal shortening. When I was doing fieldwork for my M.S. in Earth Science on the island of Penang in Malaysia, I found a terrace at 9 meters and estimates of 2 meters uplift since the last interglacial giving sea level 7 meters higher than the present, 23 feet. Peninsular Malaysia is a stable craton some distance from the Mentawai Fault the slippage of which was responsible for the 2004 tsunami. There is plenty of evidence in Malaysia that sea level was between 2 and 3 meters higher during the hypsithermal interval about 5000 years ago, AKA the Holocene Climate Optimum. Frank, you ever consider what that hypsithermal period would mean for the continuity of glacier bores?? ?